Two years of living in Stehekin, Washington trained me in menu planning, shopping for a month at a time, and improvising. You see, there’s no grocery store in this remote village nestled in the North Cascades at the end of 55-mile-long Lake Chelan. There’s also no phone service, and no road to the Safeway in the closest town at the other end of the lake. There, once a month, I’d sketch out menus and compose a grocery list, then slide the list and a blank check into an envelope addressed to that Safeway store. A few days later, my groceries and a receipt would arrive on The Lady of the Lake, the passenger-only boat that travels daily in the summer (less often in the winter) to link Stehekin with the “downlake” world. Now, although I live in another small, remote community—this one on an island in Puget Sound—I’m just a 15-minute bike ride away from a natural foods store and a full-service grocery store. And just a short drive away, farm stands sell local produce and organic meats, and there’s a U-pick berry farm and an organic vineyard and winery. You’d think with all this near-at-hand abundance I’d produce culinary feasts with ease and pleasure. 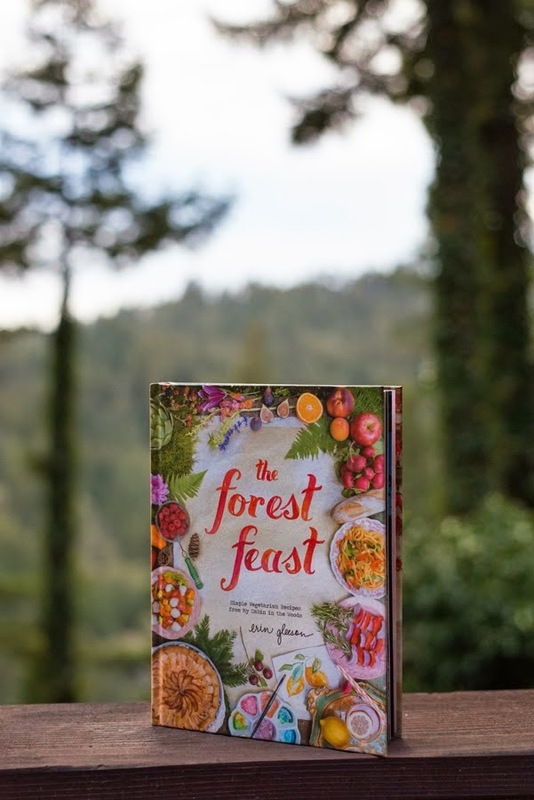 The Forest Feast by Erin Gleeson is unique because it’s part art book, part cookbook. 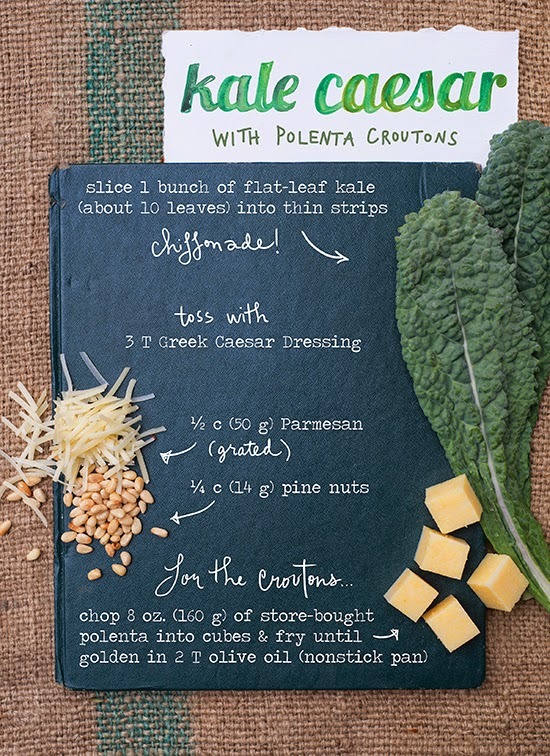 The recipes (most use fewer than five ingredients) are displayed visually without a lot of text to read through, and Erin’s own handwriting, photography and watercolor illustrations guide you through the simple steps. knew I had to try the recipe at the top of the list. 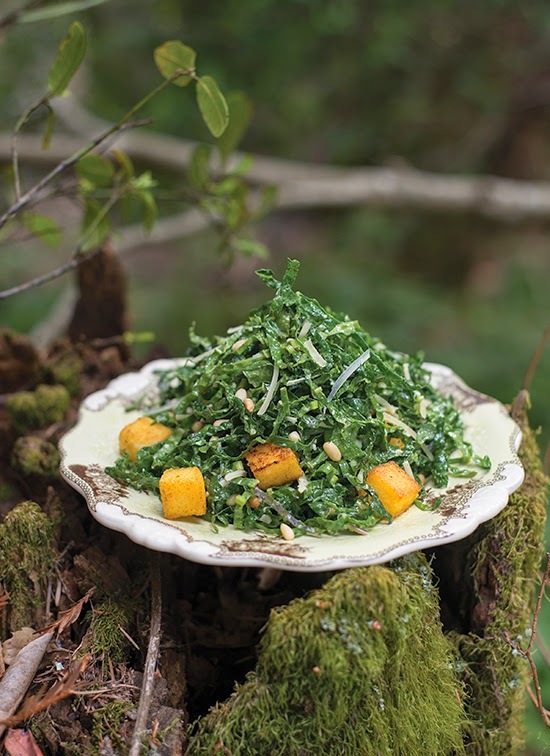 Polenta croutons on top of the salad – brilliant! After flipping through a few more pages of the book, I slipped back into Stehekin menu-planning mode and developed a grocery list of ingredients for the dishes I wanted to try in the coming week. As the days went by and the list of recipes I’d attempted grew, I began to feel like author Julie Powell. When Powell became disillusioned with work and life, she decided to replicate in 365 days the 524 recipes in Julia Child’s The Art of French Cooking. Powell’s blog posts about her effort eventually became the book, Julie and Julia – My Year of Cooking Dangerously, and a movie, Julie and Julia. While Gleeson’s cookbook is loaded with meatless recipes—18 appetizers; 10 cocktails; 17 salads + 5 dressings, 2 dips and 1 sauce; 18 vegetable dishes; and 15 sweets—not a single one involves complicated techniques or ingredients only taught at Le Cordon Bleu. 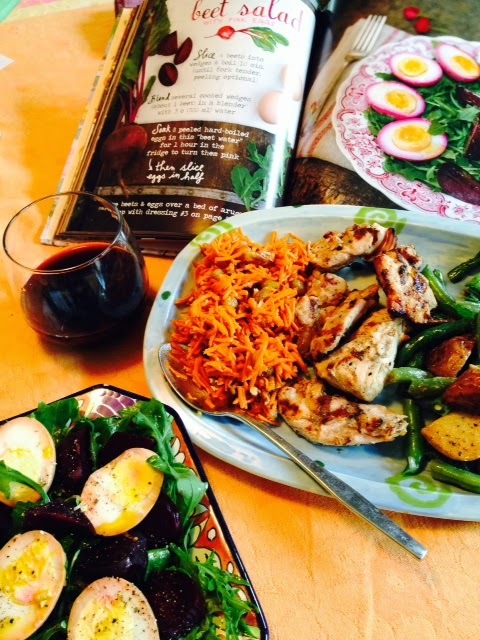 So far, I’ve made the Carrot Slaw twice (once for a potluck where the host asked for the recipe), Potato-Green Bean Salad, and Beet Salad with Pink Eggs; those served as delicious sides with grilled chicken. Gleeson’s tone is easy-going and practical (how many cookbooks say “peeling is optional?”) and invites creativity. Though I’d never made her Butternut Caprese, I felt encouraged to modify it with one of our last golden acorn squashes left from the fall harvest; when I couldn’t find smoked mozzarella on the island, I substitute smoked goat cheese. It worked! 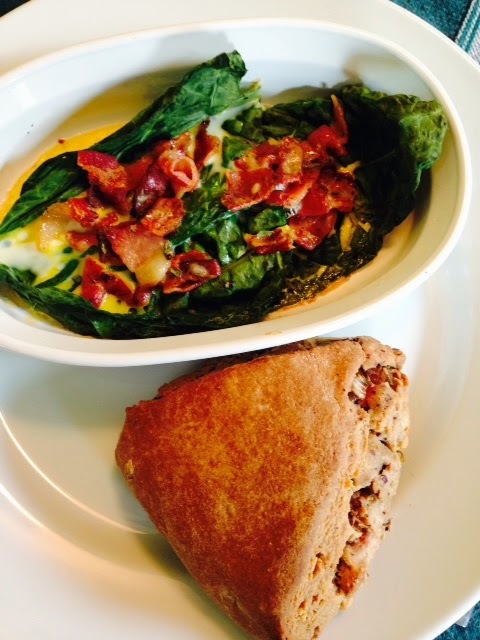 Although I don’t have the 3-inch round ramekins Gleeson suggests for the Baked Kale Egg Cups, they tasted delicious in my oblong ramekins alongside a rhubarb scone from our local Barn Owl Bakery (see my November post, Saturday Bread). Oh, and I did crumble a little bacon on top. So. Move over, Julie and Julia. 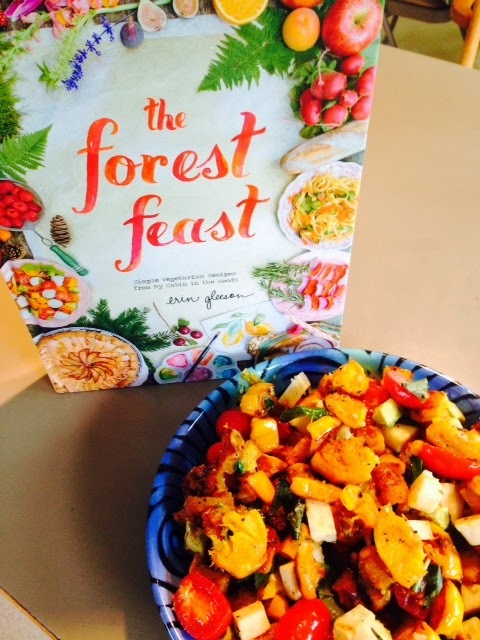 I’m well on my way to cooking and eating my way through The Forest Feast. I encourage you to buy a copy for yourself and to join me on the journey. Bon apetit!